The cause for Fulton J. Sheen's canonization began, in part, on the promises from the cardinal of New York that his archdiocese was not interested in pursuing the cause and they would transfer Sheen's remains when the Vatican said the appropriate time had come. The appropriate time arrived and, following the canonical norms, it was necessary for Venerable Sheen's remains to be moved to the Diocese of Peoria. However, in September 2014 the Archdiocese of New York said they would not allow the remains of Fulton Sheen to be moved because, in part, they were following the wishes of Archbishop Sheen and his surviving family, and they were being careful to follow New York state law. You can read their press release here. Over the years the Vatican basically said to the Diocese of Peoria and the Archdiocese of New York, "You two need to work this out." That's understandable but tricky: the canonical norms state that in the canonization process the earthly remains would be examined and relics reverently gathered in the Diocese that is promoting the cause. Canon law also makes clear that civil laws should be followed in the process of transferring remains, etc. Therefore, with the Archdiocese not wanting to lose their future saint the Diocese of Peoria's hands were tied. "The proposal ... would balance the personal wish of Archbishop Sheen to be permanently buried beneath the high altar of St. Patrick's Cathedral with the understandable desire of the Diocese of Peoria to have his earthly remains present in their diocese for the celebration of his long hoped-for beatification." For the record, there is NO record that Archbishop Sheen wanted to be permanently buried at St. Patrick's. In fact, five days before he died he had a new will made that stated he wanted to be buried in a plot he had purchased in a Catholic cemetery in Queens. Where their misunderstanding came from I don't know. The same newspaper article, from the New York Daily News, then quotes Mrs. Cunningham's lawyer Steven Cohen. He said Mrs. Cunningham and her siblings "'are not in favor of nor did they consent to the shuffle plan. I have no idea where the Archdiocese got that idea but it's not correct.'" She then ordered that Mrs. Cunningham be granted the right to transfer her uncle to St. Mary's Cathedral in Peoria. You can read the judge's ruling here. The next step they decided to take: appealing the decision. I believe that Dolan is doing what he thinks is best for his archdiocese and flock. I believe that overall he has done well for the Church. But I believe that his actions here are misguided and are causing great scandal. I believe justice and mercy both call for him to relent. Personally, I'd love to see Cardinal Dolan and his team focusing all their time, effort, and money on the cause for Dorothy Day instead of throwing away more time and money with their appeal. Graciously presented. That appeal will not hold! 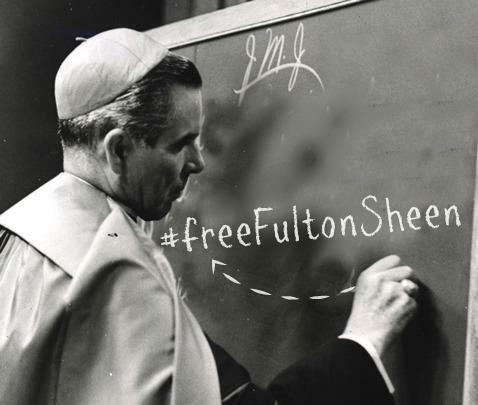 Fulton sheen will come home! *my prediction! I believe you're right, too, but oh the rigmarole! This really is a scandal. Like siblings squabbling at a funeral over who gets to inherit the china. Thank you for helping us understand this better. I will continue to keep the cause in my prayers, and look forward to the day he's officially recognized as a saint! Your detective work much appreciated! Thank you.